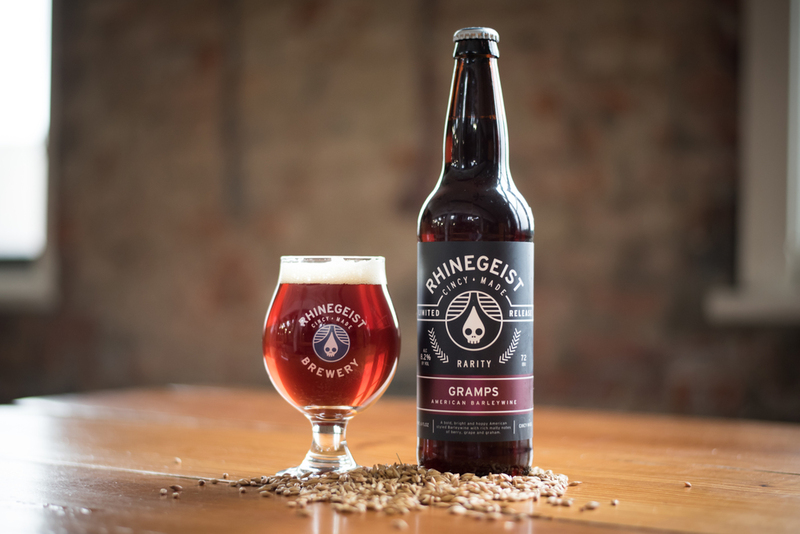 Gramps (8.2%, 72 IBU) is a bold, bright and hoppy American Barleywine Ale that's been waltzing with us at Rhinegeist since our first winter—you never regret spending a little quality time with Gramps. What’s the history of Barleywine ale? These were historically the strongest beers offered by a brewery. Often rumored to have originated in England, the English variety of the style if often quite malty and fermented with a characterful English ale yeast that tends to produce a higher level of fruity esters. The American counterpart is often drier, cleaner (e.g. less esters), and hoppier with late additions of American hops. Sierra Nevada Bigfoot is a classic example of this style. Weren’t you just in Alaska for a Barleywine festival? Yes, what better place to drink big barleywines than Alaska in the winter? It was great to see different interpretations of this style, both barrel aged and non-barrel aged. A moderate malt character, lots of alcohol, and enough hops to balance everything out. The boozy character is relatively low, but the beer is exemplified by a balance of malt, hops and alcohol. Appearance: Light haze, with a light amber hue. Off white head that is thin and has relatively low persistence. Some “legs” are visible in the glass from the higher alcohol content. Smell: Piney, citrus hop aroma at a moderate level, low esters, medium bready malt character with a hint of dark fruit and graham cracker. Taste: Moderately bitter with a dry finish. Some notes of grapefruit, orange, pine and resin. Medium bready malt character carries through the finish. What foods would pair well with Gramps? Two different dishes to have with this. The first being a dessert like crème brulee because the alcohol and malt complement the delicate custard and vanilla in the dessert. Also, steak au poivre also works great as the richness of the steak, peppercorns and sauce hold up well to the malt, alcohol and hops in Gramps. A 6 oz snifter works perfectly for this beer.